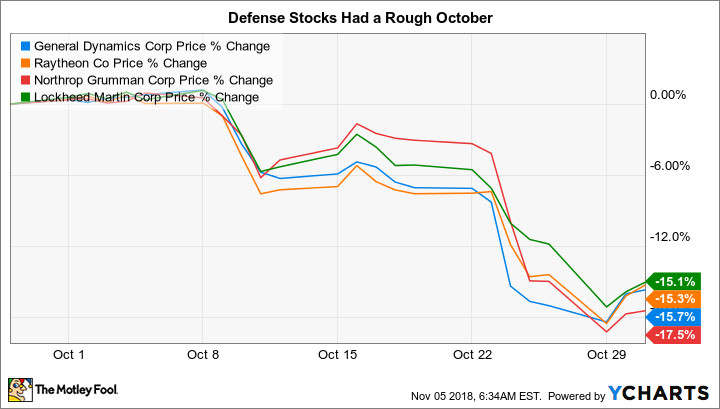 A sharp downturn in the defense sector started in the first few days of October. Raytheon Company (NYSE:RTN), Northrop Grumman Corporation (NYSE:NOC), General Dynamics Corporation (NYSE:GD), and Lockheed Martin Corporation (NYSE:LMT) all fell roughly 15% in the month, according to data provided by S&P Global Market Intelligence. And, equally impressive, they all followed the same basic path lower through the month. It was ugly across the board. Earnings were involved to some degree, but not until the later days of October. For example, toward the end of the month, General Dynamics reported earnings that left investors less than inspired about its future, and shares fell on the news. Other industry participants reported in October, too. But the broad and coordinated industry declines appear to date back to a government pushback on costs that started in late September. In September, the Pentagon proposed a plan that would, effectively, tie contractor pay more closely to ongoing performance for longer-term contracts. Defense companies generally have to foot the bill for the projects they work on, and are then reimbursed by the government for their expenses as a project progresses. If the proposed change were enacted, larger companies like Northrop, Lockheed, General Dynamics, and Raytheon could see such performance- and progress-based payment rates fall from 80% of the costs incurred to 50%, according to industry watchers. Solid execution would have allowed increases from the lower rates in the future, but the initial declines would have been material. The defense companies would eventually get fully reimbursed for their work, of course. But lower progress-based reimbursements throughout a contract would mean that the contractors would have to carry more of the costs, which would likely require additional leverage to cover the ongoing expenses, and would reduce cash flow. There was clearly a lot more to the rule than this big-picture view, but it is easy to see from these high points why the industry quickly pushed back against the proposed changes. The good news is that the Department of Defense (DOD) agreed to rethink the rule following resistance from the industry, which received notable support in its efforts from some key senators. The bad news is that some change appears likely in the future, since the DOD and the industry have now agreed to discuss options for rewriting the rule in a way that is mutually agreeable. In other words, an alteration to the current performance- and progress-based payment rate system looks like a lock at this point. It may not be as bad as the initial news suggested, but investors clearly seem to expect a less robust future in the defense sector. The impact could be felt in a number of different ways, from higher leverage and lower cash flow reducing the cash available for increasing dividends to increased cash-flow volatility, as a defense company could experience a punitive reimbursement cut for missing a key milestone. More leverage, slower dividend growth, and increased uncertainty are not the types of things that investors like to see. The industry, meanwhile, was probably due for a pullback. While these four industry giants are now between 15% and 25% off the highs reached earlier in 2018, they all remain up by more than 100% over the past five years. So the industry has seen a pretty good run, with the current news, perhaps, giving investors a solid reason to take some profits off the table in an industry that had started to look expensive. Although the news about this potential change in the way defense contractors get paid is definitely not good for the sector, it isn't the end of the world, either. For example, defense spending has been a key focus of the current president, and industry watchers expect existing programs to be spared. So the first hit from any change won't likely start showing up until 2020. However, even that's not certain, since the rules could be altered again before that point -- though it's worth noting that the defense industry has a lot of lobbying muscle in Washington. Also keep in mind that defense spending doesn't look likely to fall off a cliff, even if the payment process is altered. For example, Congress approved a military budget of $716 billion in 2019, which was higher than the $686 billion requested by the president earlier in the year. In fact, the industrywide pullback might be a good reason to take a second look at defense stocks to see if any of the individual companies are starting to look like bargains.